This study synthesized previously conducted research and identified additional research needed to attract, promote, and retain women in the transportation industry. 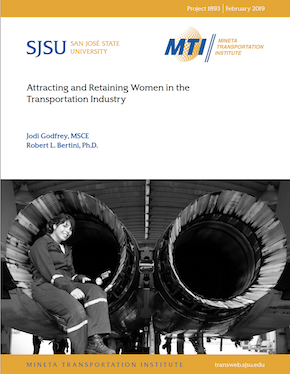 This study will detail major findings and subsequent recommendations, based on the annotated bibliography, of the current atmosphere and the most successful ways to attract and retain young women in the transportation industry in the future. Oftentimes, it is perception that drives women away from the transportation industry, as communal goals are not emphasized in transportation. Men are attracted to agentic goals, whereas women tend to be more attracted to communal goals (Diekman et al., 2011). While this misalignment of goals has been found to be one reason that women tend to avoid the transportation industry, there are ways to highlight the goal congruity processes that contribute to transportation engineering, planning, operations, maintenance, and decisions—thus attracting the most talented individuals, regardless of gender. Other literature has pointed to the lack of female role models and mentors as one reason that it is difficult to attract women to transportation (Dennehy & Dasgupta, 2017). It is encouraging to know that attention is being placed on the attraction and retention of women in all fields, as it will increase the probability that the best individual is attracted to the career that best fits their abilities, regardless of gender. Jodi Godfrey is a Research Associate at the Center for Urban Transportation Research at the University of South Florida (USF) where she works on the Transit Safety and Workforce Development Programs and the Mobility Policy Research Teams. Ms. Godfrey received her Bachelor’s and Master’s Degrees in Civil Engineering from USF in 2013 and 2015 respectively. Jodi is a member of the TRB’s Task Force on Transit Safety and Security, and a graduate of the ITE’s Leadership program, Class of 2017. Jodi is also a member of the International ITE STEM Subcommittee and Women in ITE Task Force, and is the current Treasurer for the Tampa Bay Chapter of ITE. Dr. Robert Bertini is the Director of the Center for Urban Transportation Research at the University of South Florida (USF). Dr. Bertini is currently the chair of the TRB Operations Section (AHB00), overseeing 13 committees and one task force. He serves as a member of the Board of Governors of the IEEE Intelligent Transportation Systems Society. Dr. Bertini was also named the WTS Tampa Bay Person of the Year in 2018.